Kansas State was one of the more interesting teams in the country heading into this season. The Wildcats began the year in the Top 25, thanks in large part to their run to the Elite Eight last year, which, it can be argued, was the luckiest in NCAA Tournament history. K-State entered last year’s Dance as a 9-seed after an up-and-down 22-11 (10-8/Big 12) season. No one would have predicted that before Greg Gumbel tossed to One Shining Moment, they’d have been 40 minutes from the Final Four while only having to wear the road unis once. The ‘Cats used their characteristic defense to advance past No. 8 Creighton in the first round (holding the Jays to 33% shooting), but their run was probably going to come to an end in Round 2 until UMBC pulled the unthinkable and toppled No. 1 Virginia. The stunned Wildcats barely muscled past the Retrievers in the second round in one of the ugliest games in tournament history, and suddenly, they were on to the Sweet 16. There, Kansas State used its experience to down freshman-laden Kentucky, which also benefited from a major upset (Buffalo over Arizona) to advance to that point. The Wildcats’ divine and providential run came to an end at the hands of Sister Jean and Loyola-Chicago in the Elite Eight. It was an abrupt–if not fitting end to a crazy season. K-State earned a lot of preseason buzz after that three-game winning streak, but does a March run as serendipitous as theirs necessarily justify a Top-15 spot? Kansas State entered the season at No. 12 in the AP poll. To be fair, the ‘Cats did return a lot of talent, and their tournament run happened without leading scorer Dean Wade, who was dealing with a stress fracture. Wade, the former Kansas high school player of the year, also missed six games in the middle of this season with a tendon tear. The 6-8 senior has been oft-injured, but when he’s on the floor, he’s a difference-maker. He’s averaging 13.1 points and 7.3 boards per game, and is shooting 51 percent from the floor and 42 percent from three. Those numbers will have NBA teams interested. 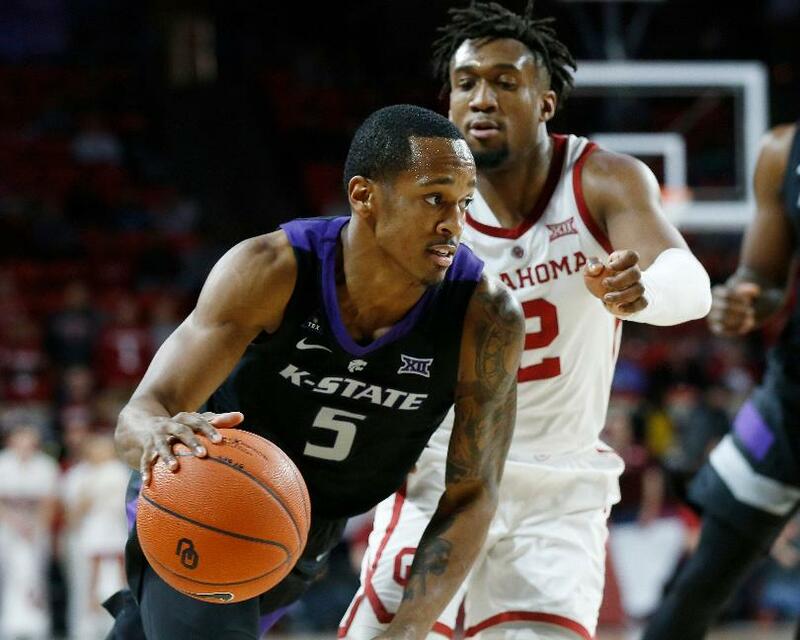 K-State is led both vocally and in scoring by senior Barry Brown Jr., who was the best player on the team during last year’s tourney run and is averaging nearly 16 points per game this year. Xavier Sneed (9.9 ppg) and Kamau Stokes (10.6 ppg) are also capable scorers, and key components to the team’s suffocating defense, which ranks 6th in the nation in points allowed, at 59.5 per game. K-State trails only Virginia (51.7), Texas Tech (54.8), Michigan (56.6) and Virginia Tech (58.8) among major conference teams in that category, though the Wildcats’ success there might have more to do with pace of play than anything else (KSU ranks outside the top 50 in opposing field goal percentage). It looked like the Wildcats might return to their mediocre ways when they lost back-to-back games at Marquette and Tulsa, and were blown out by Texas at home to start conference play, but they’ve turned things around and have looked more like the team everyone expected them to be in October. K-State has won three straight and is now 13-4 on the season. The streak began when the Wildcats picked themselves off the mat in a head-jerking comeback win over West Virginia, a game in which they trailed by 21 points. They then went on the road and beat the No. 20 team in the nation–twice. First K-State edged then-No. 20 Iowa State on a Barry Brown game-winner, then they thumped current No. 20 Oklahoma in Norman, 74-61, in a game that wasn’t that close. Brown, who also scored the deciding basket against the Mountaineers, was named Big 12 Player of the Week. Head coach Bruce Weber had found himself on the hot seat for much of last season, which looked to be yet another ‘meh’ campaign for him in Manhattan, but thanks in part to divine intervention and UMBC, he’s got things rolling again. As Wildcats fans well know, the NCAA Tournament is all about matchups, but this team has the players, the style of play, the confidence and the experience to make another deep run should they get to March. They’ve still got a lot of work to do to get there, but things are looking up in the Little Apple. Their goal this season should be a bracket-busting run with no buts, and they just might have what it takes to make it happen.